Today, take a rare look inside the cavernous archive — inaccessible to the public — that houses every piece of Coke folklore imaginable. There is the World of Coca-Cola, where more than a million tourists dive into history of the biggest brand name that ever rose from the South. But less than a mile away, a cavernous archive inaccessible to the public houses every piece of Coke folklore imaginable. Today, we visit Ted Ryan, the keeper of that archive, and take a peek inside his storehouse. Ted Ryan has a habit that drives his family nuts. They’re quietly watching a movie together when all of a sudden Ted grabs the remote, backs up the film, freezes on a specific frame and takes a photo, which he later posts on Facebook. His wife and children roll their eyes and patiently wait for him to resume the movie. The object of Ted’s attention? A Coca-Cola sign in the background of a scene, or an actor wearing a Coke T-shirt or drinking from the instantly recognized bottle. The interruptions happen again and again whenever Ted sees red. Anything Coke, anytime it appears. “Coca-Cola is in my blood,” he says. It’s also on his resumé. Ted is Coke’s director of “heritage communications,” better known as the company’s chief archivist, the keeper of the more than a century’s worth of folklore built around the world’s most iconic brand. The archive is not the World of Coke, a popular tourist attraction a short walk but a world apart from the archives at The Coca-Cola Company’s headquarters in downtown Atlanta. The World of Coke is a museum-like display of the past enjoyed by a million or so visitors a year. The archives are a vast repository inaccessible to outsiders but actively mined by the company. The belief that the past really is prologue makes this collection of what has come before a catalyst to what is yet to be. That’s unusual. Lots of companies assemble and preserve their pasts. Instead, Coca-Cola actively studies the past to inform and inspire its future. Row upon row of movable shelves in temperature-controlled rooms house the collection. Bottles, hundreds of them, in shapes and sizes Coke drinkers haven’t seen since the 19th century. Trays in era-specific designs. Dolls, coolers, lamps, neon clocks, toys, bottle openers, radios, appliances. It’s about 2.5 miles of shelving and two football fields of flat file storage of items bearing the familiar Coke color and script. And there are the priceless art collections. Posters, photographs and paintings by world-renowned artists. Some were used in advertisements in eras past, others were salvaged bits of history, like the photo of Elvis Presley drinking a Coke at a segregated Southern lunch counter. Norman Rockwell paintings that helped sustain the mythical image of America in the middle of the 20th century line one of the rows. Photos of Elton John from another decade are in another row. Andy Warhol’s painting commissioned for the launch of “New Coke” hangs on a wall. And then there are the Santa Claus images on posters and paintings, reminders that the ruby-red cheeks, white beard, and Old St. Nick jolliness were first embedded in our culture as Coca-Cola ads. A stroll down the archive’s aisles is a journey through American history. Pioneering magazine ads featuring African-American models reflect the company’s place in the Civil Rights Movement. Documents in the storage cabinets record the famous dressing down the late Coca-Cola President Robert Woodruff gave Atlanta’s white establishment when it tried to snub the party celebrating the Rev. Dr. Martin Luther King Jr.’s Nobel Peace Prize. Myths about Coke abound. One with legs is the story that putting bubbly soda water into John Pemberton’s formula was an accident. “For 130 years we’ve been trying to put that one to rest,” Ted says. “It simply isn’t true, but it keeps surfacing.” So, too, does the one about cocaine in the early drinks. Caffeine, yes. Cocaine, never. Ted also can explain why red became the identifying color: “The company didn’t want tax agents to confuse Coke with bourbon, which was then packaged in brown." To facilitate that learning, Ted uses the collection to form insights about how it can be valuable in the present. He recalls for all who need reminding that in 1886, Coke’s first year in business, it sold about nine a day in Atlanta. At that time the soda was sold at soda fountains, often in local drugstores. The idea to bottle it came later from an enterprising pair in Chattanooga. His point is that all successful companies and their products evolve. The mission of the Coke archives is to track that evolution and help predict its future course. “The real value of the archives is understanding the connections that people around the world have to Coca-Cola and how those links are changing,” says Evan Holod, Coca-Cola brand director. Evan and his team recently considered a promotional campaign focusing on the “ice cold” theme the company has used in the past. They searched through piles of old photos, contact sheets, notes, and finished ads from decades past, focusing on the idea of a Coke as perfect refreshment on a hot summer day. As a result, they created more modern versions that hewed to the look and feel of old ads. The challenge is continuity, understanding how what was once successful can be adapted to the present and succeed again. In casting for models in recent ads, for example, Coke sought to balance the edginess of contemporary tattoos and piercings with the wholesomeness of Coke’s tradition. Because defining “new” can only be done in the context of “old,” the archives have been an essential tool since the 1940s, when the collection began under Franklin Garrett, who was also instrumental in creating the Atlanta History Center. Ted Ryan came aboard to undertake the task of moving the collection into the digital age. There are now more than 100,000 digital images available for Coke’s use. But the collecting goes on. Ted receives emails and Facebook tips about available items. Occasionally one bears fruit, like this one about Marilyn Monroe. Back in 1953, when Monroe was a rising starlet but not yet Marilyn, she filmed a Coca-Cola commercial at Harold Lloyd's estate in Beverly Hills. She supposedly wore the bathing suit designed for “How to Marry a Millionaire,” although it seems hard to tell for sure just from black and white photos. The cameraman reached out to Ted, who still has the chain of emails. “Since these images were most likely created during a Coca-Cola commercial shoot,” cameraman Frank Critchlow wrote to Ted, “I believe your company would have the most legitimate claim to their publication.” Ted was thrilled to find never-before-seen images of one of history’s most photographed people filming a Coke commercial. And then, there are the 5,000 members of the Coca-Cola Collectors Club. 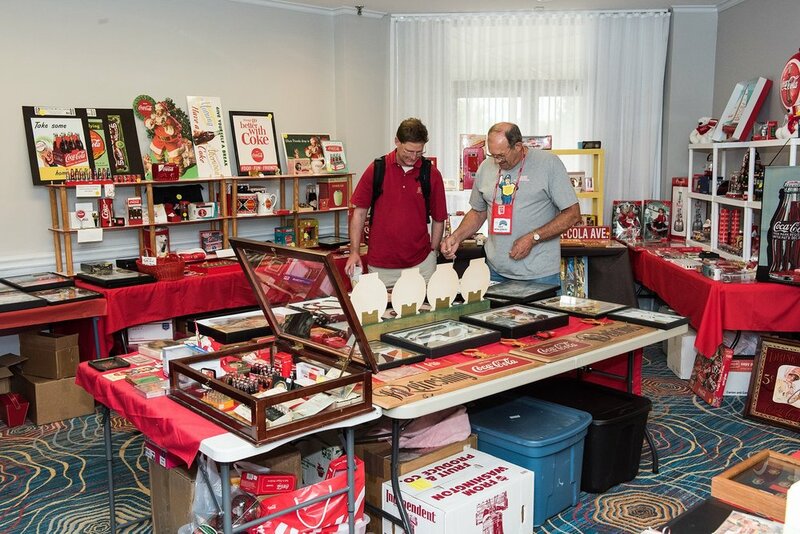 About 600 of them gathered in August at the Hilton Buena Palace in Orlando for the annual “family reunion” and swap meet. As they do every year, the members laid out on their hotel beds their newly acquired treasures along with items they were trying to sell. 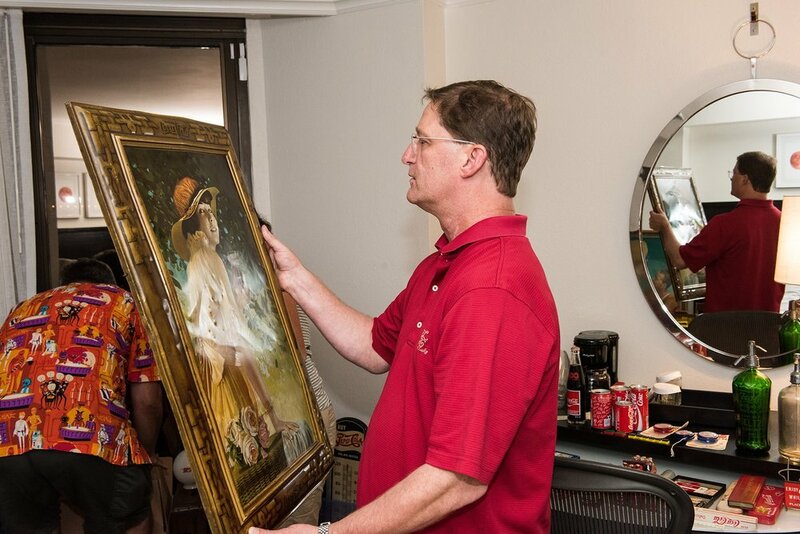 Members wandered from one room to the next, exchanging stories and negotiating prices on everything from Coca-Cola pencils for a buck to Tiffany lampshades for thousands of dollars. Some of the members collect narrowly, specializing in just Coca-Cola trucks or Olympic pins, for example. Older items, especially those from around 1900, are generally the most valuable. The early 1920s was another demarcation, according to Ryan. That’s when the company began mass-producing Coke-branded objects. 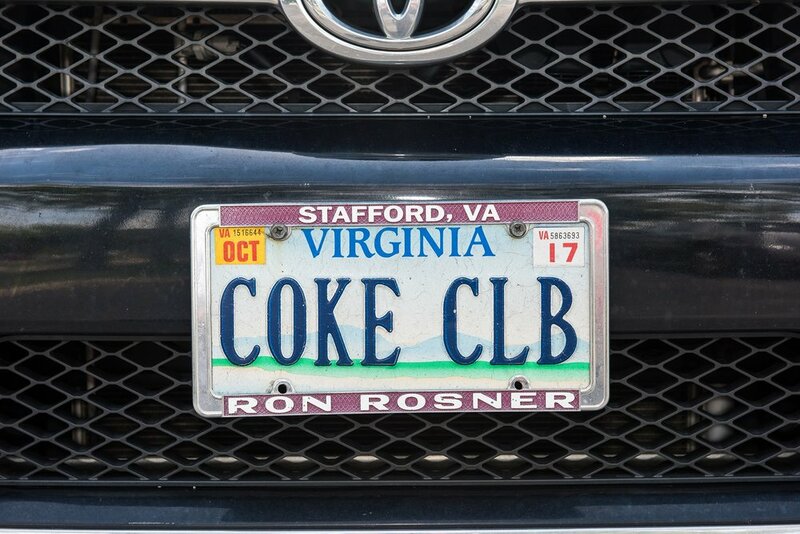 For these collectors, Coke is in their blood. Vickie Fisher, an Atlanta nurse, remembers her great-grandfather’s farm in Zebulon, Georgia, where he had a Coke thermometer on a tree. In the 1920s, her grandfather opened a pharmacy. Her father, when he was young, worked there as a soda jerk, making Cokes for customers. Vickie has been going to the annual confab since she was a teenager. She bought a 1920s marble soda fountain like the one her grandfather had in his drug store. But her favorite item is a tray from 1899 that her dad bought for her mom. Bill Combs is a 30-year member and the club’s incoming president. Bill telephoned Ted, who is a convention regular and friendly with many club members. Ted couldn’t have been happier. It turned out he was helping mount a special World War II exhibit for the World of Coke. Bill donated the letter and photo, both of which are on display there today. Most of the new acquisitions come to the company via email and social media these days, but Ted still loves to stop at flea markets and antique stores as he drives around the South. He can tell you about that abandoned gas station with a red sign out front, between Dahlonega and Cleveland, Georgia, on Highway 52. And he’s never stopped at an antique store that didn’t have a Coke tray, lamp, or old sign. Ted likes to stop for peanuts and Coke – “the goober cocktail, the farmer’s lunch” – and he can tell you about the Tomato House gift annex up in North Georgia, a real institution where they have the Lance peanuts and the little bottles of Coke. He can’t resist. Ted is a dispenser as well as gatherer of information. Towns across the South are always asking for specific paint colors to freshen up the old Coke murals on restaurants and gas stations. In Atlanta, just a few miles down North Avenue from Coke headquarters in the Poncey-Highland neighborhood, residents rallied for a freshening of the Coke mural on the outside of Manuel’s Tavern, a city institution. In Portland, Oregon, there’s a big Odwalla mural that caught Ted’s eye a few weeks ago. It’s no accident that this new company product, a line of juice smoothies, is being marketed using a 19th-Century medium –– wall paintings. Ted’s own childhood Coke story influenced an upcoming ad campaign. In the ’60s and ’70s, Ted and his brother would walk through their Buckhead neighborhood to Ed Springer’s Springlake Pharmacy at the corner of Collier and Howell Mill roads. “You’d sit at the counter and order your Coke with a shot of cherry or vanilla or chocolate,” he says. That was product personalization, but of course Ted and his brother didn’t call it that. Decades later, Evan Holod’s marketing team was considering ideas for a new product line. First stop –– the archives. “Evan was talking about the handcrafted nature of Coca-Cola,” Ted says. “Every single Coke until 1932 was hand-crafted – every Coke – but you don’t hear much about that anymore. … So we pulled together some materials for him. He began to ask about the weirdest flavor we used to put in, that kind of thing. Holod and team came up with something they’re all very excited about. But of course, they will not spoil the surprise. We will have to wait to learn how Coke again used the archives to spin tomorrow out of yesteryear. It’s a story that goes on, from past to future, but always back through the past.